We are conveniently located a short 5 minute walking distance from numerous cafés, restaurants, live music venues, and one of the best breweries in town! For travelers looking to explore the Alaska mountains and in need of outdoor gear, stores like Alaska Mountaineering and Hiking, REI, and Play It Again Sports are all within 2-3 blocks walking distance from our doorstep. We are a short taxi or bus ride from the airport and can arrange a late check-in with advanced notice. Our focus is creating a welcoming and community driven atmosphere for all travelers, international and domestic, visiting Alaska. Our accommodations are clean, safe, and affordable. We offer comfortable dorm beds, hot showers, and private rooms. Base Camp Anchorage hostel is conveniently located in midtown Anchorage with easy access from the airport, just 10 minutes away! 10 minute taxi ride from the airport, which costs under $15 US dollars. Bus from the airport drops you off just steps from our hostel for less than $2 dollars: Take the Route # 7 bus northbound towards downtown and exit at 26th Avenue and Spenard at the white windmill. Make a right on 26th Avenue and we are on the left, just a one minute walk from the bus stop. – Cancellations require 48 hours advanced notice for a full refund. If advanced notice is not given you will be charged the first nights accomodation. – Major Credit Card required to hold your reservation; your card will not be charged until you arrive. You can pay in cash upon arrival or use your credit card with a $2 credit card processing fee. 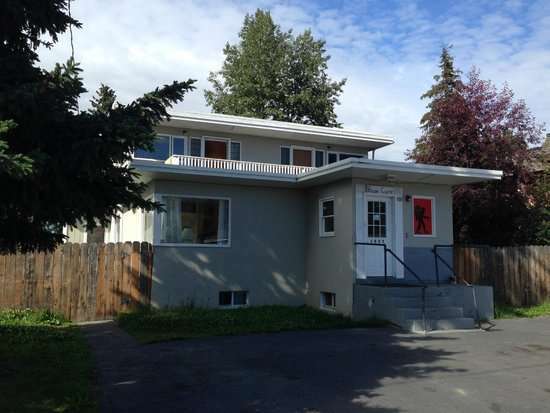 – Base Camp Anchorage hostel is tailored for tourists and travelers visiting Anchorage. We generally find guests stay less than 5 days with us in between visits to nearby sights and towns in Alaska. We have a maximum 5 nights stay. If you are planning on staying in Anchorage longer, contact us ahead of time. – All of our guests must own a major credit card or international passport. – No children 12 or under, ages 13-17 yrs must be accompanied by an adult.